Following the Leitz purchase of the Marchioni company, what is the continuing ontogeny of Tiltall? My understanding is that Uniphot, an US export company, purchased Tiltall from Leitz hoping to export Tiltall to European and Asian markets, however Uniphot collapsed in the early '90s as did a number of other international photo trading groups such as Mamiya's Osawa in Japan, etc. In 1998, Tiltall's current manufacturer, Oliver Yang, was asked by the folks that controlled some of the Uniphot holdings to continue Uniphot's Tiltall iteration and Oliver seems to have been true to that design to present. Somewhere in the mix, we have the mysterious Star-D Tiltall. The Davidson Optronics Company was located (photo left) in West Covina, a suburb of Los Angeles. 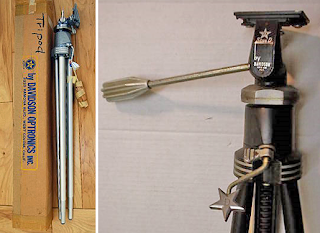 The Davidson Company still exists and made a number of interesting tripod designs during its history including the tripod shown above with the unique "Star-D" handle crank. According to numerous rumours, Davidson did not ever trade on the Tiltall name (who knows, there may have been some partnership breakups between the Uniphot heirs). But might have made some trademark sale of "Star D" to Fred Albu of Unifot. To add to the confusion, some quite innovative tripod models do trade under the name "Tiltall" with no relation to the Marchioni design - many with quick release mechanisms and removable tripod heads - see some of Adorama's Tiltall offerings. [Ed: I thank Daniel Wong for the word "ontogeny". UPDATE: current owner of the Tiltall mark, Oliver Yang, seems to add the name Tiltall to many other non-Marchioni designs. Humbug!!] Any corrections to this mythology are highly appreciated. ADDENDUM March 12: Speaking today with Sam Bailey, of Davidson Optronics.. Sam started working for Davidson Mfg Company in 1963 and at that time, the Star-D Tiltall had already been in production by Davidson since, he believes, the late 50's. Sam says production ended in the late 60's, 1968 or so. We may surmise as the Marchioni Bros did not sell their concern to Leitz until 1974, that we have a parallel universe existing before the advent of the Leitz or Uniphot Tiltall. The Star-D could be had in at least two models, the better/best of which (the "Professional") had the brass collets in the leglocks, like the original. I own (and prize) one of these and the only difference I can detect is that the two tilt handles have black plastic grips rather than the aluminum knobs of the Marchioni bros. original. Otherwise, built like the proverbial brick s---house, and NOT lightweight. Sturdy is as sturdy does. I dunno about the current Tiltall, having neither seen nor handled one. I've heard that it's not made like the older ones. "They don't build 'em like they useter, Horace!" Can anyone shed conclusive light on this history? concurrently. The Star-D was cheaper, both in price and in fit and feel. ADDENDUM- June 08 Note Asian Star-Ds in Comments below. I am still hoping, as the California Star-D copy occured during the Marchioni Bros lifetime, if the relationship was friendly or acrimonious? Perhaps a Marchioni Jr or GrandJr would know. ADDENDUM - June 09 On 4-Oct-2006, Bob Salomon - head of HP Marketing posted this on the Large Format Photography Forum. I know Bob and consider him very knowledgeable in the history of the photo industry, but having spoken to an employee of Davidson (above), I cannot yet sort the following. Some of the internal logic is a bit bumpy: "Star D ended up being owned by Fred Albu who also owned Camera Barn a large camera store in NYC and the Uniphot distribution company who, among other products, was the distributor for Hoya. Marchoni sold the Tiltall to Leica USA who manufactured it for a few years and then sold the Tiltall line to Star D who then sold two versions, the Titall and the Star D copy. (Ed: Davidson says they ceased manufacturing BEFORE Marchioni's sold to Leitz - above) Uniphot has been out of business for about 25 to 30 years. The Tiltall went off the market when Uniphot was closed. The tools and trademark were for sale by the Uniphot trustees and after a few years was purchased by the Chinese company that makes and sells it today. Under Uniphot several Star D tripods were sold and Star D also made tripods in the 50s as an independant company before Fred bought the company. There is no sucessor company to Uniphot or Star D and neither has existed for 25+ years so parts would have to be made. A replacement tripod would be more cost effective then repairing." Fred Albu is also mentioned in this history of Tiltall. which also mentions Omicron Electronics of Chatsworth which I believe is the missing link between Uniphot-Levitt's demise in the early 1980s and our current, Oliver Yang. Wasn't "Star-D Photo Products" a Japanese photo accessories company? Every Star-D tripod, lens, filter or other accessory I've ever seen was made in Japan or (the later stuff) in Korea. I currently own a Star-D D-120 Quickset Panhead Tripod that's almost 42 years old. I could probably mount a cinderblock on it and it wouldn't even flinch, it's that tough. I've never used one of the Star-D Tiltall clones but the other Star-D tripods I've used have been rock solid over the years.